Play golf with the leaders of the European colonial superpowers to decide the fate of Africa! Escape from the haunted mansion, a new adventure every time! Juggle your way through life, chuckles! Lorenzo the bull has beaten the Matador, now he must escape from the bullring and save his mother. Day 6 and 7 where crazy, finally managed to finish: check it out at https://slash.itch.io/heroes-of-noresskia will write a bit about it soon. No coding was done on day 3, but I defined some designs for the actual player interaction. Absolutely no advancement. Sad panda. What about a source code release? 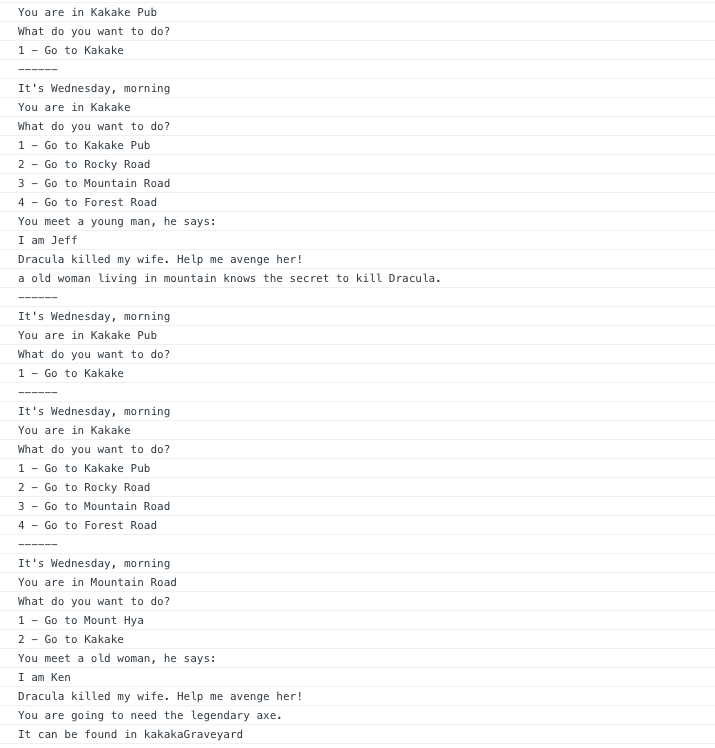 Barebones generator for a lineal plotline. Was able to finish make it work after simplifying the design a lot for this next increment. One thing that is still not there is the ability to adapt the plot to the player's journey. Shooting for a static world because grand scale world generators make worlds players feel are discardable and they don't care about them. 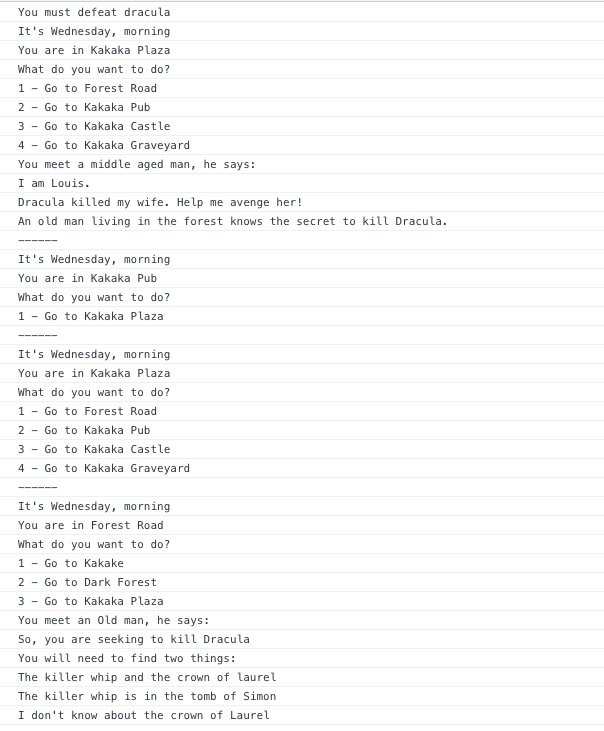 Created a simple engine for a Interaction Fiction like thing, and a static plotline for it. Next step is having a program that can generate the timeline himself. Will fill this with more info probably. We are very serious about it :) that would make your game an out of challenge 7drl. 7DRL Challenge 2019 community » General Discussion · Replied to LucKey Productions in Can I attend with a game I've already worked on for a few days? Yes, anything for inspiration and concept is good. Just think if you are working in actual Assets that will be included in the game, these are meant to be done within the challenge timeframe. 7DRL Challenge 2019 community » General Discussion · Replied to artless in Can I attend with a game I've already worked on for a few days? yes, pre-existing code is ok as stated by the rules. Just no code or art made *specifically* for your entry. 7DRL Challenge 2019 community » General Discussion · Replied to sgibber2018 in Can I attend with a game I've already worked on for a few days? yes, design docs or notes are ok. Just no code or art made specifically for the project. 7DRL Challenge 2019 community » General Discussion · Posted in Text-based? No. Actually there is a discount for Oryx tilesets which you might find useful to create a GFX one. 7DRL Challenge 2019 community » General Discussion · Posted in Berlin Interpretation - How strict is 7drl challange? Yes, Innovation is very welcome and more valued than sticking to the strict roguelikeness definitions. Just a note, the timeframe for the 7DRL challenge is from March 2 to March 10 in your timezone (Saturday to Sunday, as it's always been :)), pick max 7 days to work within these dates. 7DRL Challenge 2019 community » General Discussion · Posted in ? CrowdForge 2019 ? I removed it for now, I'll contact the crowdforge guys and see if they are willing to set up a space for this year's. I don't think it was used a lot last year, but maybe someone will find them useful. 7DRL Challenge 2019 community » General Discussion · Posted in Can I attend with a game I've already worked on for a few days? Hi! Unfortunately this goes against the rules of the challenge, coding must start inside the dates provided, and finish before the final date. We completely trust you, just take note of the time you started, and send your final build 7 days after that. So if you start on Saturday, 1:23 PM, you gotta submit your game before next Saturday, 1:23 PM. 7DRL Challenge 2019 community » General Discussion · Posted in Link to last year's itch jam? Save games can only be loaded from the title screen, they are meant only for you to be able to pause and continue your journey, not to roll back to a safe spot. Did you die or use the Kill Character option? save files are deleted when your character dies. As promised I'll seriously contemplate the doability of a real device, even Kickstarter might be an option for a larger production scale, once I have the time, which should be this summer. That would be cool. I got pretty good feedback for my game, and lots of idea to expand gameplay while keeping the format. - Another thing is a recurrent jam: what do you think about repeating this jam regularly, say every half year, or maybe every four months? I have already some minor ideas I would like to try for it, more on this subject in the lengthy Post-Mortem I'm planning to write once the results are in. What version? Can you please try on a different browser, just to confirm? 7DRL Challenge 2018 community » Community Discussion · Posted in Cannot vote? I don't think I'll be able to include that on the 7DRL timeframe tho. I'd be lucky if I can finish something playable. I couldn’t afford to code on the game today. Another crazy day at work and adulting… but this is the 7DRL, there are no excuses. Room Collisions have been implemented, instead of checking point inside trapezoid, I just put some invisible blocks as boundaries. Doors now have to be “used” in order to navigate, and you can potentially use other objects in the world too. 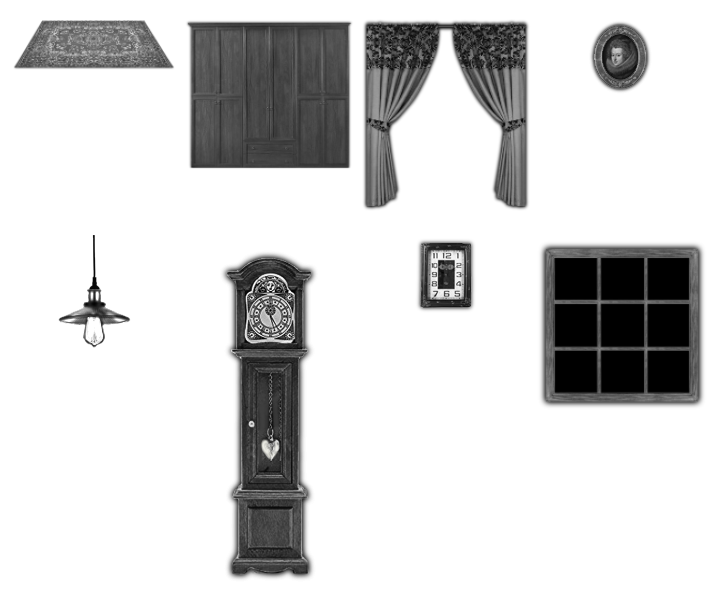 Giovanny continues working on the art part, mainly focusing on more floor and wall types, as well as some initial objects. Expected to advance a bit more but was caught up in a lot of work. Coordinated with Giovanny the format for the assets. Agreed on a style (black layout + paper texture + color), hoping we can achieve it. Basic project setup, output a sample empty room with a sprite moving around using cursor keys. Talked with Ashton Morris, he’s going to work some awesome ambiance and SFX for the game.